Panforte is a dense, sweet, richly fruity Italian Christmas treat from Siena eaten in small slivers with a glass of festive booze. 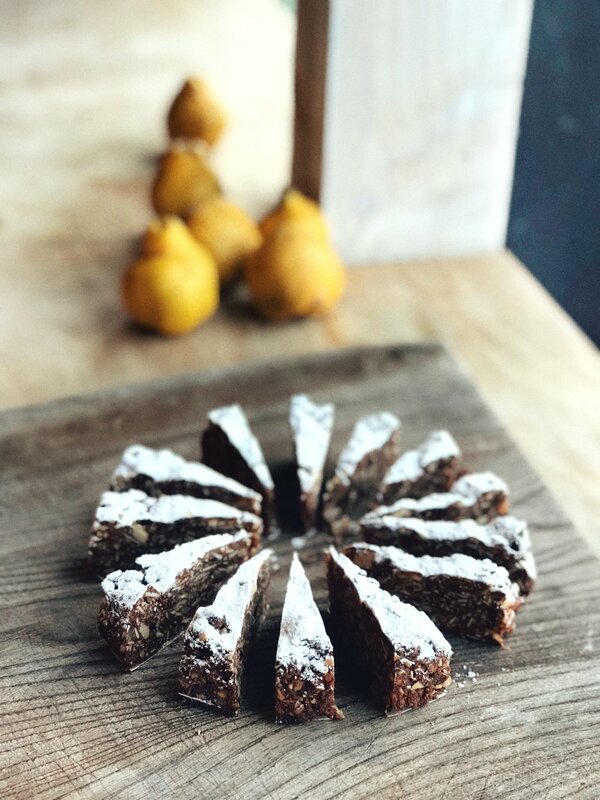 Due to a generous amount of honey, panforte has a wonderful chewiness that reminds me of the fig sweets I used to eat as a child - these were simply a fat dried fig torn along it’s edge and stuffed full of nuts and maybe a little hunk of dark chocolate. The bitterness of walnuts, cocoa and peel (or at least zest) are essential to take the edge off all that sweetness, but you could also add a little bite with sour cherries or cranberries in place of part of the weight of figs or use coffee liqueur in place of brandy. If you’d like a more chocolatey version, just reduce the buckwheat and increase the cocoa and add some chunks of dark chocolate to the mix. Make it now and stash away for Christmas Eve, when you’re settling down with the presents all wrapped and a delicious sense of anticipation. You’ll feel very grown up and continental. Heat the oven to 200ºC fan (or 220ºC without fan). Line the bottom and sides of a 23cm cake tin with a removable base (ideally springform) with parchment and then rice paper on the side that will touch the cake. Put the nuts on a baking tray and roast for five minutes, then allow to cool slightly, turning the oven down to 160ºC fan (or 180ºC without fan). Tip just under half the nuts into a food processor and grind into a loose rubble, then very roughly chop the rest. Tip into the mixing bowl with the buckwheat flour, cocoa, baking powder and spices and whisk to combine. Roughly chop the figs and the peel, add to the bowl and stir well. Put a small pan on the scales, weigh both sugar and honey into it and stir in the alcohol. Gently heat while stirring just until it starts to bubble - be very careful that you don’t let any splash over the edge as the alcohol is flammable. Immediately stir into the other ingredients until well combined, then scrape into the prepared tin and press down with wet hands. Bake for about 30 minutes until a little risen and just firm, then allow to cool before turning out and trimming the rice paper. It will keep for at least a month in an airtight tin. Dredge with icing sugar before you serve it.